Travelling to Italy is always a good idea. The bel paese offers an ever-intriguing mix of history, art, good food and splendid nature. The best bit is that the specific proportions of this mix change from one Italian region to the other (and there are 20 of them in total!). Which keeps your interest aflame and makes you feel like there is always something else to see and do in Italy. Hence, you keep coming back for more or, at least, craving to do it. Well, in case you need any reasons to travel to Italy in 2019, let me tell you that this is going to be a special year to find yourself here. From an important anniversary to splendid new exhibitions opening their doors, from exciting nation-wide events to a myriad of local happenings, 2019 is the year to travel to Italy for the first or the nth time. Keep reading to find out specific details! 2019 is officially the National Year of Slow Tourism in Italy. The intention is to promote little-known areas in Italy so that travellers can experience this beautiful country authentically. The majority of people travelling to Italy usually limit themselves to Rome, Florence and Venice with a day trip to Cinque Terre thrown in. Well, 2019 is a great opportunity to escape this predictable triangle and explore exciting places in Italy which are rich in history and culture. To facilitate this exploration, the Italian authorities have invested in the reactivation of heritage railway lines which will help you travel in style to exciting Italian destinations. In addition, the country’s thousands of biking and hiking trails will inspire you to discover angles of Italy which you may have never considered: medieval walled towns, organic farms, small alpine lakes with crystal-clear waters and so on. My Personal Recommendation: Italy is not a country to be rushed. You are bound to discover artistic and historical treasures of worldwide class even in the smallest Italian villages and towns. So, don’t dismiss a place simply based on its size and don’t limit yourself to just the largest, most well-known Italian cities. If you want to experience Italy authentically, I suggest that you head to its medieval walled towns where you can admire some great military and civic architecture and visit castles, art galleries and even live medieval reenactments. Here are a few names for your consideration: Ferrara, Cittadella, Serravalle (Vittorio Veneto), Lucca. Sunday at the Museum (#DomenicalMuseo) was a very successful Italy-wide initiative which guaranteed free entry to over 480 Italian state museums, galleries, archaeological sites, monuments, parks and gardens on every first Sunday of the month. In 2019 though, the free entry days will increase from the previous 12 to 20. It’s just that they will be distributed in a different manner than before. This was announced by the Italian Minister of Cultural Heritage in November 2018. Some of the free days will be observed at a national level. For example, during the colder months of the year (January to March and October to December) when the flow of foreign tourists is at its lowest, the over 480 Italian state museums and other cultural establishments taking part in the scheme will continue to be open for free on the first Sunday of the month. In addition, entry to them will also be free for a whole week in March 2019 (from the 5th, Tuesday, to the 10th, Sunday). Start booking your holiday now! It is expected that this free entry week will kick-start the high tourist season in Italy in the best possible way! During the rest of the year, the directors of the participating museums and other cultural establishments will have the liberty to choose what to do with the remaining eight free days. For example, they can keep the first Sunday of the month free, choose a different day during the week or even split the free day into free time slots spread over different days during the month. This is expected to help manage better the flow of visitors, the Italian Minister of Cultural Heritage said. It remains to be seen how the updated scheme will work. 20 days of free entry to over 480 Italian state museums and other such cultural establishments is nothing to be sneezed at though. Click here to check the list with participating museums and cultural establishments. My Personal Recommendation: Costs add quickly when you travel around Italy. Booking your holiday in such a way that it coincides with a free museum entry day is a great way to see some of the world’s best art completely free of charge. If you travel to Italy any time from October to March, keep in mind that the first Sunday of the month is a free entry day to over 480 Italian state museums, galleries, archaeological sites, monuments, parks and gardens. The rest of the time, keep an eye on the websites of the museums you are interested in to see when their free days or time slots will be. Or, simply, travel to Italy between the 5th and the 10th March 2019 to take maximum advantage of the scheme! Starting in 2019, young people from 18 to 25 years of age will be able to visit over 480 Italian state museums, galleries, archaeological sites, monuments, parks and gardens for only two euros per ticket all throughout the year. The expectation is that this way young people will be incentivised to visit museums more often in order to build a lifelong habit coupled with an interest in history, culture, and art. If you are between 18 and 25 years of age, 2019 is a great year to travel to Italy to take in as many as possible of its amazing state museums and other such cultural establishments for a fraction of the price the rest of us, adults, have to pay. Consider yourself super lucky! My Personal Recommendation: Make sure that you take full advantage of this great price. Fill up your travels in Italy with exciting cultural visits and get to know the likes of Leonardo, Michelangelo and Mantegna up close and personal. In addition, discover the art and heritage of hundreds of other Italian artists – ancient, classic, contemporary, and modern. You’ll be in for a treat! in 2019 Italy has a lot to offer to art lovers beyond the scope of the purely Italian cultural heritage. 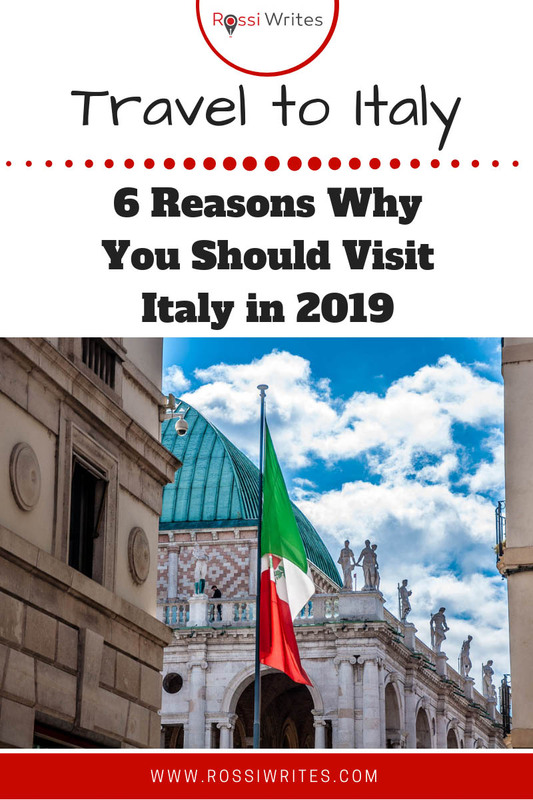 Make sure that you tick at least one of these important events off during your travels in Italy in 2019. For an exhaustive list of forthcoming exhibitions and events in Italy, use the Calendar function of the Artribune website. You will be surprised by the scope of art and culture happenings taking place all over the bel paese. My Personal Recommendation: Come to Vicenza – the Northern Italian city which I currently call home – to see the exhibition ‘The Triumph of Colour – from Tiepolo to Canaletto and Guardi’. The interesting thing about this exhibition is that it showcases Italian masterpieces which are currently owned by the Pushkin Museum in Moscow, Russia. You have until the 10th March 2019 to see it. One more tip – a whole new museum is to be opened towards the end of 2019 in Milan. It will be dedicated to the Etruscan history and art. One of the main events in Europe in 2019 is marking the 500th anniversary of the death of the biggest Renaissance master Leonardo da Vinci. So, expect some incredible happenings in his home country – Italy. In Florence head to the Uffizi Gallery to see the special exhibition ‘The Leicester Codex of Leonardo da Vinci: Water as Microscope of Nature‘. The codex has 72 pages handwritten by the Master himself between 1504 and 1508. Each page contains his notes and drawings on the nature of water and the characteristics of the environment. The Codex was lent to the Uffizi Gallery by his current owner – Bill Gates (he purchased it in 1990 for over 30 million US dollars). Original drawings by Leonardo complete the exhibition which is on until 20th January 2019. Head to Milan between 16th May and 18th August 2019 to see an exhibition of original drawings by Leonardo and other Renaissance artists. The exhibition will run concurrently to the extraordinary opening (from the 2nd May 2019 onwards) of the Sala delle Asse (in English: Room of the Wooden Boards) in the Sforza Castle (In Italian Castello Sforzesco). The room was originally frescoed in 1498 by Leonardo da Vinci himself. The Biblioteca Ambrosiana in Milan will organise in 2019 four exhibitions dedicated to the genius of Leonardo. For example, in March 2019, you can see there 23 of the most important folios of the Codex Atlanticus – a collection of Leonardo’s writings and sketches on a myriad of topics – from mechanics and hydraulics to mathematics and astronomy. The Biblioteca Reale in Turin has plans in place to open a permanent display of the 13 Leonardo drawings which the Biblioteca owns (among them Leonardo’s famous self-portrait), in addition to the Codex of the Flight of Birds authored by the Renaissance Master in 1505. My Personal Recommendation: For a long list of events in Italy dedicated to the 500th anniversary of Leonardo da Vinci’s death have a look at this article (in Italian) on the renowned Arte website. Expect many more events and happenings commemorating the artistic and engineering genius of the Renaissance Master to take place in other Italian cities and towns all through 2019. Matera is famous the world over for its Sassi – a designated UNESCO World Heritage Site dating back over 7000 years. The Sassi are cave dwellings and rock churches connected by streets, archways, and stairways that have been dug into the rocky sides of a steep gorge. My Personal Recommendation: Keep up to speed with all the news about the events taking place in Matera in 2019 at the official site here. The programme for Matera European Capital of Culture 2019 looks really exciting with happenings exploring many different forms of cultural expression, and centuries-old local traditions. Travelling to Italy is always a great idea. Yet 2019 will be a particularly exciting year to visit the bel paese. With so many world-class events taking place from one end of the country to the other and from January to December 2019, start booking your flights and accommodation right this moment.